These women are close to my heart, they are my family. And this is their personal battle with the Big C.
An aunt underwent chemotherapy treatment for lymphoma. Her daughter is currently undergoing chemotherapy for breast cancer. My maternal aunt was was diagnosed with lymphoma in 2006. She underwent chemotherapy treatment, but she has yet to be declared in complete remission. 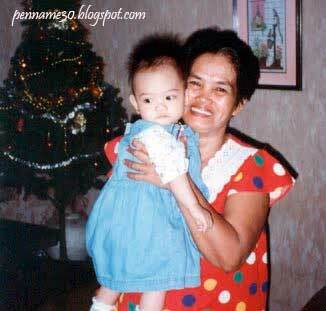 It’s been months since I last saw Tita Saning, my 64-year-old maternal aunt. Although we’re both living in Quezon City, I rarely visit her in her house since I became busy with family life. She is frail, but her hair is a lot thicker now unlike when she was undergoing chemotherapy. She used to have a healthy body, not fat, but heavier than her present weight. She barely weighs 100 pounds. 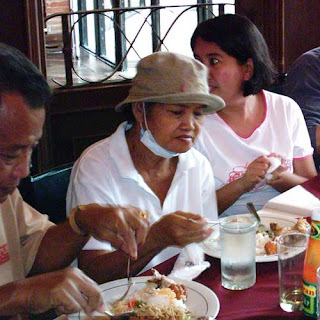 In the middle part of 2006, Tita became sickly and started to lose weight. She gets cough and cold almost every month and my cousins notice a growing lump in her neck. Tita’s family never realized those signs were already warning signals of a serious health condition. When she was taken to St. Luke’s Medical Center for checkup, the doctor who saw my aunt advised her to undergo biopsy right there and then. Tita said a needle was initially inserted to the lump to remove a tissue sample. It was done without anesthesia so she felt the painful procedure. After the needle biopsy, doctors have ordered the removal of her lump. The procedure was called open biopsy. Everyone was praying that the disease would not be as serious as cancer. Although the result showed Tita has lymphoma, we were relieved that it was in the initial stage of development and the chance of being cured remain high. My aunt’s family are hopeful that Tita will get well with the proper and immediate medical intervention. Based on research, Stage I lymphoma means “the disease is present in only one group of lymph nodes, or, more rarely, in a single organ that does not belong to the lymph system”. This means that Tita’s lymphoma can be cured by chemotherapy. Chemotherapy treatment is the simple administration of drug into the blood that kills that tumor cell. My aunt tries to hold back her tears as she slowly recalls her experience from day one. “I cried when my daughter told me I have cancer. I couldn’t accept the fact that I will be leaving my grandchildren. Who will take care of them when I’m gone?” she said in the vernacular. “It’s difficult for me physically and emotionally when I know I have to stay in bed after the treatment and no one will cook and take care of my family,” she added. Sickness doesn’t stop my aunt from looking after her family. She is the same typical caring Tita that I know. Tita Saning’s treatment started when her biopsy test was completed. She was given Mabthera through slow infusion into a vein or intravenous infusion. Each session lasts for three hours. She is currently taking a maintenance medicine called B.P. NORM 10mg once daily for her blood pressure, and Vitamin C to boost her immune system. My aunt completed six sessions of chemotherapy treatment given every three weeks from July to October 2006. And another four sessions every three months for one year. Each chemo treatment costs a whooping P100,000. They are not financially well-off, in fact, Tita only earns from repacking charcoal and selling processed meat. But her family was able to support her chemo treatment. Thanks to her daughter who happens to be working at St. Luke’s. Cez shoulders half of the expenses through salary deduction. Also, they were able to secure a guarantee letter from the Philippine Charity Sweepstakes Office (PCSO) pledging the amount of P800,000. Unlike other chemo patients, my aunt was spared from the “nightmarish” side effects of chemotherapy such as dizzy spells, nausea and vomiting. Besides losing her hair in the course of treatment, she said she only have to deal with her forgetfulness which she pointed to the chemo medicine as the culprit. Other than that she doesn’t feel anything awful after each treatment. She stays indoors for 10 days while wearing facial mask to protect her from acquiring infections that will weaken her defenses against cancer cells. She also wears bandana to cover her thinning hairline. She also underwent CT scan after the full cycle of her chemo treatment to see how she has responded to the treatment. Ironically, my cousin Cez, who is doing all she can to support her sick mother, is also undergoing chemotherapy for breast cancer. She was diagnosed last year and underwent mastectomy to remove the affected breast. From the initial stage of treatment, my cousin said she has lost her appetite and could only tolerate soft food diet. Despite what happened to her and her family, I never see a trace of sadness in her eyes. My cousin said she has come to terms with her fate. “I cried it out and leave my fate up to God,” she said. Tita Saning is thankful that her condition has been detected in its early stage. The doctor attending to both mother and daughter has been very helpful to explain to them all the information that they need to know about their illness. Meantime, I would like to share some information pertinent to this post. I was able to interview Dr. Gracieux Fernando of the Philippine Society of Medical Oncology in the past and she talked about cancer detection and treatment. She said majority of cancer patients in the Philippines learn about their condition in later stage of the disease so that treatment becomes costly. For his part, Dr. Alan Paul Olavere, of the Chemotherapy Unit of the Medical City Hospital, said 50 percent of expenses incurred for cancer treatment go to chemotherapy alone. Chemotherapy is the simple administration of drug into the blood that kills the tumor cell. Aside from early detection and diagnosis, Fernando stressed the importance of patient empowerment. “Patients should be taught to become active partners in treatment decision making. This means that patient should talk to his doctor, learn to ask questions. Doctors are presenting the treatment options and let the patients choose what kind treatment that suits his financial capability,” Fernando told the author in a previous interview. Fernando also urges fellow oncologists to recommend generic medicines to their patients to decrease cost of treatment and explore other options like putting the patients under drug trials. “Be sure that you get your money’s worth as possible. Make sure that the doctor is open to open dialogue because like everyone at the end we are not here to tell you what treatment you need we are here to propose options. It is up to you to select. We really advocate second up to fourth opinion,” he said. The World Health Organization noted that one-third of cancers (all types) are preventable, one-third is curable and one-third depends on palliative care. “The best way to cure cancer is prevention. How do you do it? Have a healthy lifestyle – no carcinogen like tobacco smoke, eat the right food – vegetables and fruits,” said Olavere. My aunt ended our interview by leaving a word of advice for those undergoing chemotherapy treatment, “never lose your faith and pray for miracle healing“. This entry was posted in Experts view, Health Advocacy, Inspirational and tagged breast cancer, cancer patients, cancer treatment, chemotherapy, lymphoma on June 20, 2011 by Yami. I wonder what happened to the government program that aims to promote voluntary blood donation among young people. About five years ago, health authorities said voluntary blood donation will be integrated to the lessons taught in public high school and state universities. According to then Health Secretary Francisco Duque III, lessons about voluntary blood donation will help foster a positive attitude towards the sacrificial act. The school-based program, if materializes, primarily seeks to encourage more volunteer blood donors. In 2006, the partial blood collections in the Philippines were placed at 500,000 or 65 percent of the target. At the time, the government intends to collect blood from 1 percent of the total 85 million population or 800,000 persons. Safe blood supply, according the health experts, is especially needed during the lean months of April, May, June, November, December and January, when blood collection is low. It was also around 2006 that the government through the National Voluntary Blood Services Program has started the centralization of blood testing and component processing in several blood centers in the country to ensure safety of donated blood. The World Blood Donor Day is observed yearly to pay tribute to voluntary, unpaid donors who have saved the lives of those in need. This entry was posted in Health Advocacy and tagged blood donation, voluntary blood donation, voluntary blood donor., World Blood Donor Day on June 15, 2011 by Yami.